The US is considered by many as the backbone of Israel and the mother of many evils in Middle East. With the presence of various pro-Israeli lobbies and pressure groups rallying around the corridors of power in Washington to press their case, they have been highly successful not only in setting the agenda in favour of Israel, but also makes sure that the Palestine voice is not heard. Many believe that this is a typical phenomenon in Washington and hence an internal issue of the United States. But the pro-Israeli lobbies are a decisive factor in most European countries and its influence is felt manifold in Britain. These pro-Israeli lobbies are a coalition of wealthy individuals and organizations who actively work to shape British foreign policy in a pro-Israeli direction. Though the percentage of British Jews who wholeheartedly support the pro-Israeli lobby in very minimal, they have been highly successful in portraying their cause to be of great concern to the majority of the Jewish community. The lobbies has got great influence and access to all major parties including the Labour and Conservative to the extent that they shape the foreign policy the United Kingdom, much as their counterparts in the United States. This is not something particular to the Conservatives, but is in line with the Labour Friends of Israel stance that UK shall continue to foster strong relationship with Israel as it is being a close ally of the UK with regular warm and productive exchanges at all levels. Back in the nineties pop music millionaire Michael Levy was made the special envoy to the Middle East under Tony Blair in return for the estimated £15 million he had raised for the Labour Party in the prior elections campaign. As he was not part of any ministry he had a free hand at doing whatever he intended to do on behalf of the pro-Israeli lobby. An unelected friend of the Prime Minister having so much influence over British policies in the Middle East did damage the reputation of Britain in the Middle East and hence the negotiations he had with Israel and its Arab neighbors on behalf of Britain are still kept secret. Money plays a big part in the lobbying game and millions of pounds in donations from businessmen and others are flown into the bank accounts of these politicians and political parties. Besides from raising cash, some of the pro-Israeli lobbies in parliament also pay for and arrange trips to Israel. They have send almost as many MPs and candidates on trips to Israel as have been made by all MPS to the United States and Europe combined over the last eight years. These MPs get enormous donations to their party funds and it would be stupid to believe that these contributions come with no strings attached. These MPs then become passionately concerned about Israel and that is reflected in the foreign policies of the United Kingdom. Moreover, financial pressures are also exerted by these lobbies to coerce any dissent within these parties to fall in line to the Israeli policy. The influence of these lobbies is not restricted to bankrolling political parties and favours extracted in return. They also try to define the debate in order to limit the options that British politicians can choose when it comes to issues pertaining to Middle East. The hand of CFI in shaping up the British opposition against the UN resolution following judge Goldstone’s Report criticizing Israeli human right abuses in Gaza is a classic example of their clout. 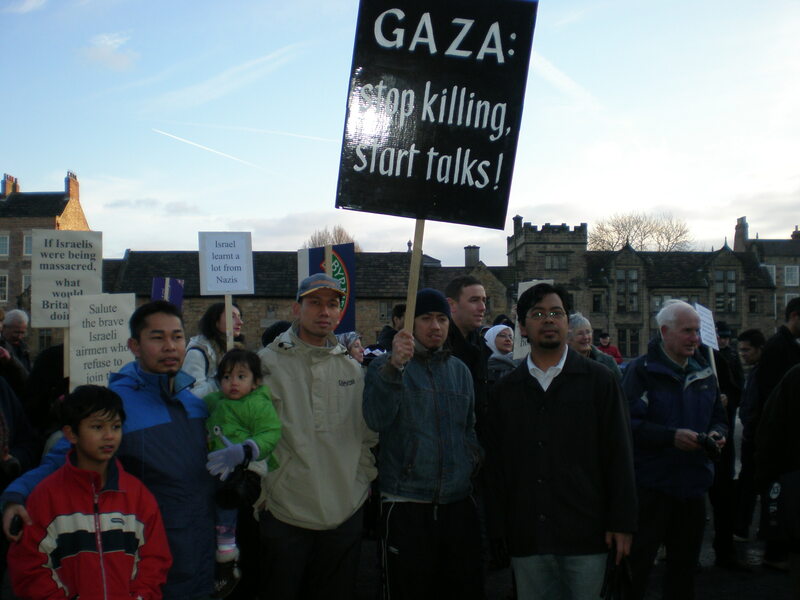 There are various other pro-Israeli lobbies including Britain Israel Communication & Research Centre (BICOM), Jewish Leadership Council, Zionist Federation of Great Britain, and Board of Deputies of British Jews. Their activities include, but not restricted to, getting the Israeli message across the British Universities, silencing any criticism of the Israeli policies inside Israel and elsewhere and engaging in successful Public Relations campaign to shape the media coverage of Middle East conflict. High profile members of these pro-Israeli lobbies even own business units in the Occupied Palestinian territory that is considered as illegal under international law. This would tend to indicate in which direction the message of these lobbies are going. Israel is really fighting the war on two fronts, the first is the military campaign being waged in the occupied territories against the Palestinian people and the second is the Public Relations (PR) Campaign being waged throughout the world media to ensure continuous support for Israel’s military occupation. In addition to the military occupation in the West Bank and Gaza, Israel is also involved in an attempt to ideologically occupy the world media and these lobbies are the key functionaries in that respect. Sophisticated media outlets in UK including The Guardian and the BBC have been at the receiving end of these censorships. These have gone to the extent that the journalist get to the feeling that it’s not worth the trouble and better stay away from reporting the truth about Middle East. BBC, which had previously run emergency appeals for disasters around the world including Palestine past, declined to air a humanitarian plea for Gaza victims in the 2009 January Israeli invasion under the pressure of pro-Israeli lobby. These institutional frame works of Israeli lobbies and their political interest in combination with Israeli Public Relations department shape media coverage of the Middle East. At the same time progressive Jewish organizations opposing Israeli government policies, let alone scores of Muslim organizations, that strive to bring out the ground reality rarely make it through these institutional filters. Britain cannot wash her hands off from the plight of Palestinians today for its involvement in creation of the state of Israel. Now Zionism is becoming more pervasive in British politics as is already rampant in the United States. It would need huge amount of mettle both from the British politicians and the media to stand against this high profile pressure group. And the act needs to be done soon, before it would become an obsession and a moral liability for the British parliament to support anything and everything that Israel does according to the whims and fancies of its insane leaders.